Electric staplers for packaging and printing can be used in a variety of different ways. Saddle staplers can bind paper together along a spine. Rapid staplers can be chained together electronically so that they all fire at once. 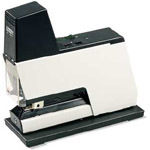 Boatman Marking has a wide variety of electric staplers including the Rapid 105 and Rapid 106. We provide service for electric staplers and carry electric staples.